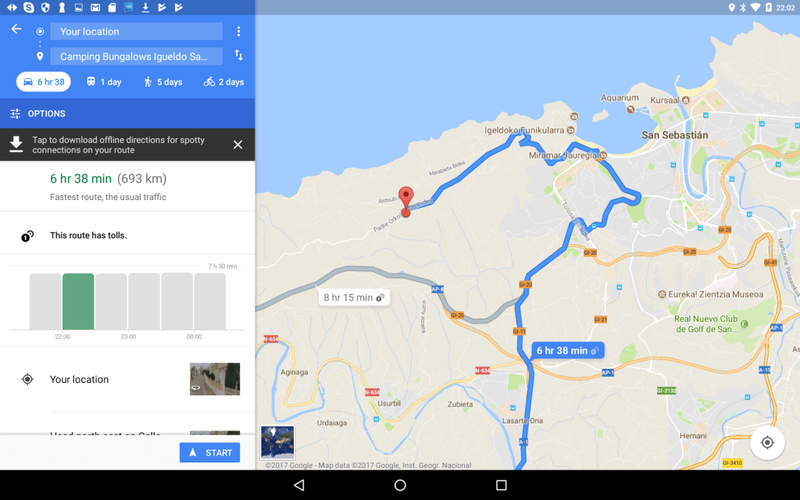 During the summer when we were on holiday in Northern Spain we had issues with our Garmin Camper 760 LMT-D taking us on roads that were too narrow for our car and caravan even though it had the length and width input correctly. Now that we have moved to a motorhome we want to ensure that we don’t have similar issues. We have tried the Garmin with revised sizes and it still routes down roads that are too narrow or unsuitable. I have therefore been looking at alternatives, there is a Parrot Asteroid Smart installed in our motorhome running the iGo software and this so far doesn’t seem much better than the Garmin. I need to do some more testing with this though. I have therefore looked at alternatives. 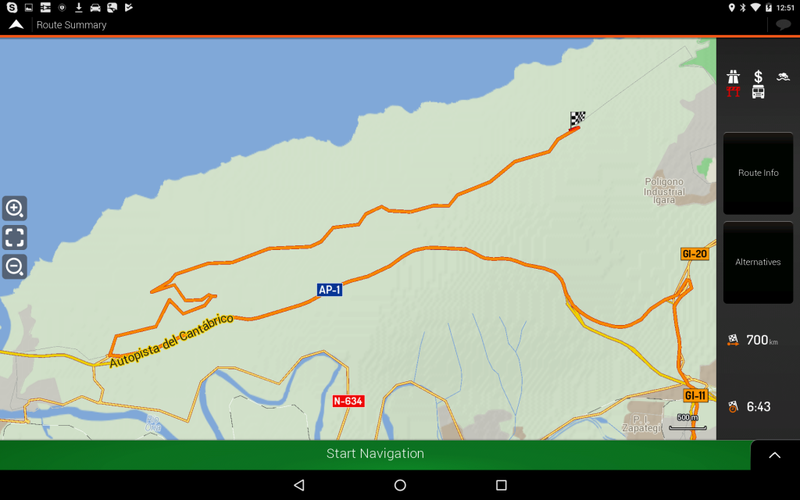 I have used Camping Igueldo near San Sebastian in Northern Spain as the destination as this Garmin route was particularly poor. I have downloaded various software packages onto an Android Tablet with an external Bluetooth GPS and this is what I have found so far. Updated with more reviews 3rd March 2018. Updates in red. 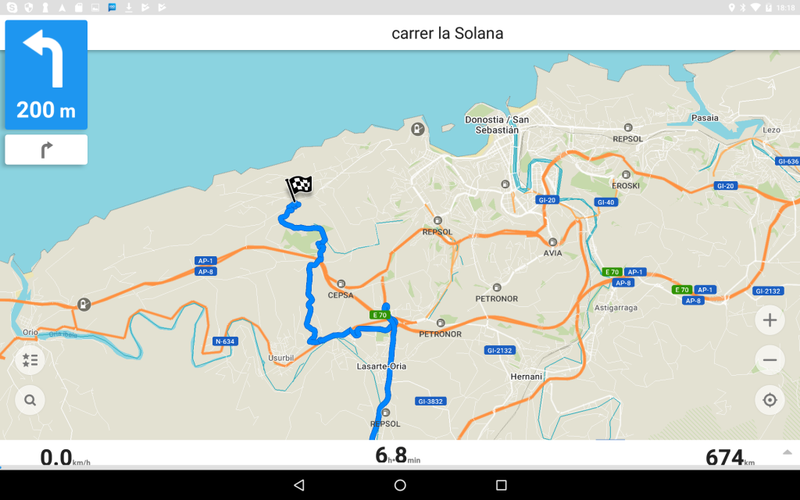 This was one of the nicest looking maps and was easy to set up and it routed correctly through San Sebastian to the campsite. The software did warn that the destination may not be appropriate. The software was easy to set up and configure and it allows the input of the vehicle size which I did. I do not like the map display but I may be able to play with that if I explore the settings some more. The route that it chose however was totally inappropriate, this was the first route that the Garmin took us in the summer and part way along this route you hit a No Entry sign and cannot go any further. Speaking to the locals this road has been No Entry for years and yet I downloaded the maps in October 2017. I just installed the standard CoPilot software rather than the truck or caravan specific version. 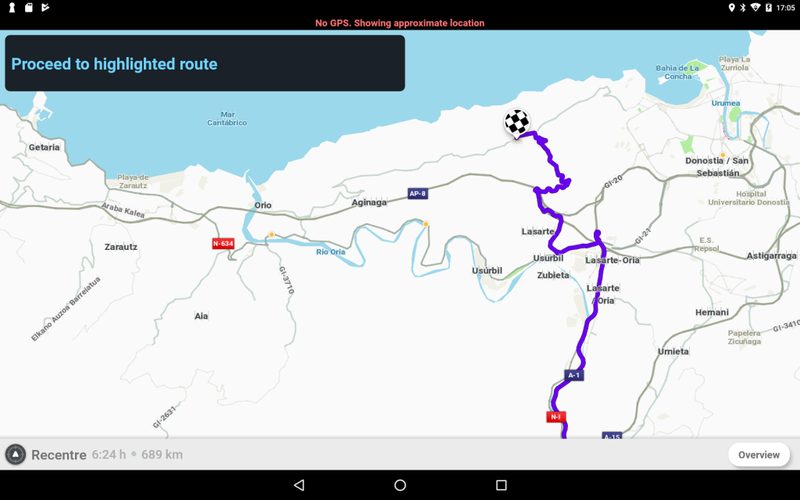 It was easy to configure and the route it generated was the correct one and it looks good too. This software is quite big and took a while to download and has extensive configuration options which took a while to set up. The route it chose is the one the Garmin re-routed us onto after we got to the No Entry sign mentioned above. This route was far from ideal and was exceptionally narrow and we had some issues with passing oncoming vehicles, it was also a much longer route than it could have been. Easy to set up and configure and the map display is not bad. 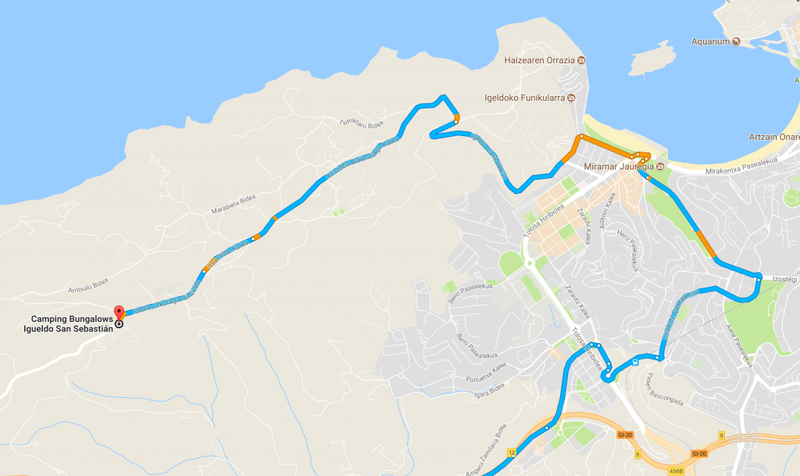 It routed to the campsite down the correct road, however, it did route right through the centre of San Sebastian and also unnecessarily round a loop and this made the route unsuitable. It also offered two alternative routes, neither of which is suitable. With some help from a friend I finally got this app working. 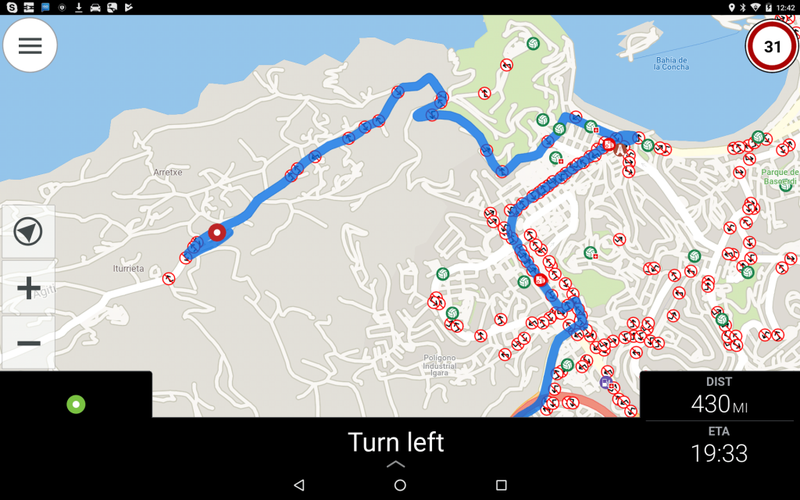 It needs all the maps between your start and end location before it will plot the route BUT the app doesn’t warn you that you that you don’t have all the maps and just does nothing. Once it had plotted the route it is another one that wants to take an inappropriate route to the No Entry road. With some help from a friend I finally got this app working. 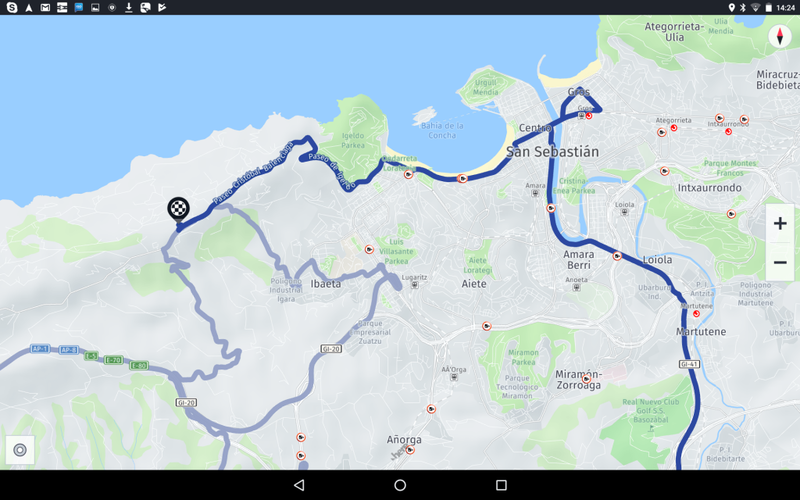 It needs all the maps between your start and end location before it will plot the route BUT the app doesn’t warn you that you that you don’t have all the maps and just does nothing. Once it was up and running the route it plotted was the correct one. So another one to add to the possible list. 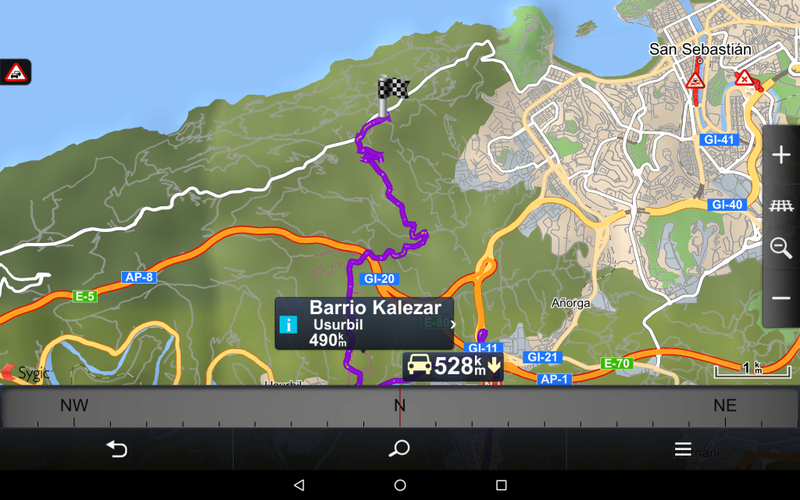 I tried Garmin Basecamp with the route set for an RV and the route it created was the one that the Garmin Camper 760 finally took us on. Again not an ideal route as it is very narrow and twisty. A lot of people like Google Maps and its routing. This is the result using this on a computer rather than on the tablet and whilst slightly different to the other software it certainly routes down the last part of the route correctly. After another suggestion I have tried this software. 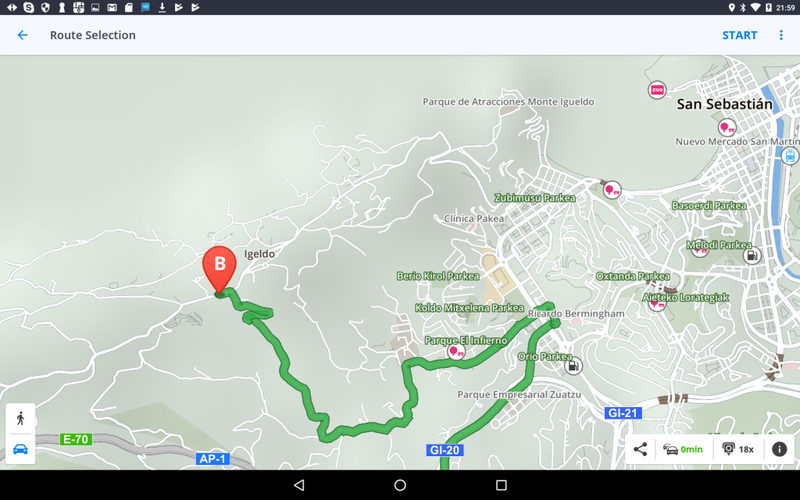 It is not very easy to use and it insists on a 3D view and the route it calculates is as the others that take you to the No Entry road. 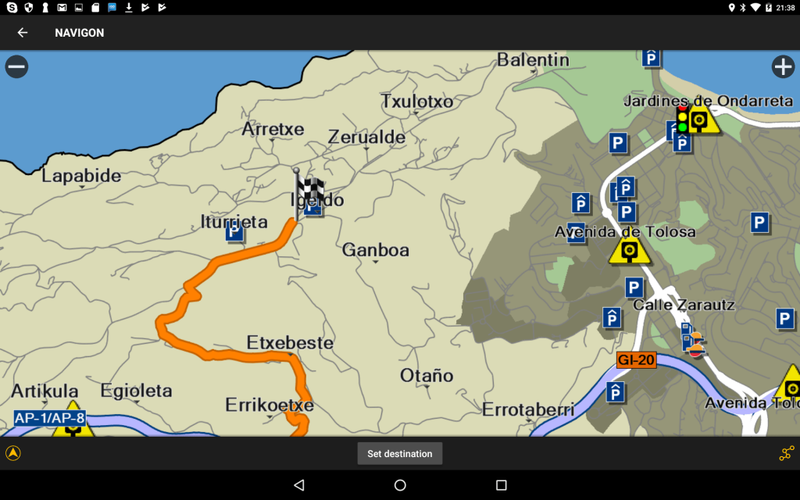 Easy to set up with nice looking maps with lots of useful information on the screen. The route again takes you to the No Entry road. 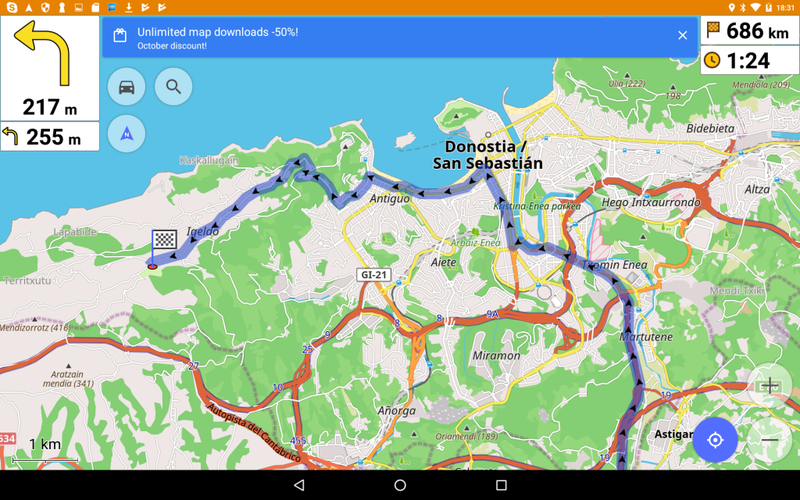 As would be expected Google Maps on the tablet plotted exactly the same route as the desktop and offered to download the map for use for navigation. I have had several comments from people about how good the Garmin is. To prove that it is not a one off I put in a short route to near where I live. 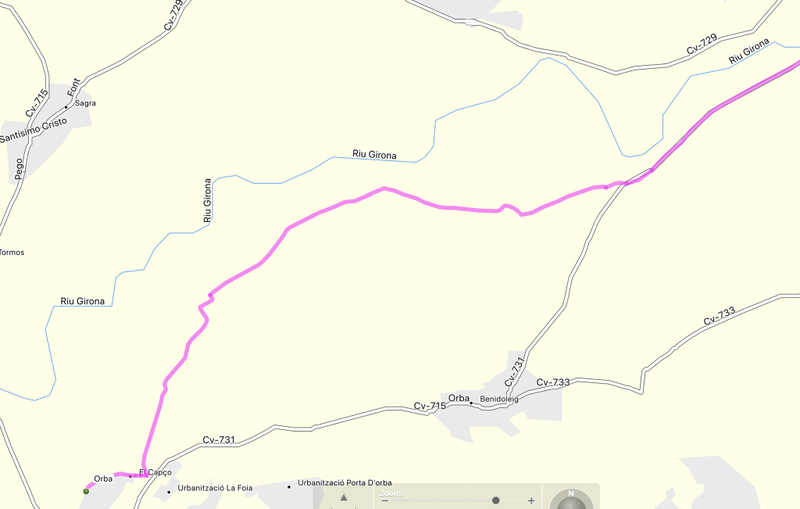 Again Garmin wanted to take me down single track farmers roads rather than staying on the main CV731. This was recommended by my son and I checked it out as potentially it looked like a winner with users updating the map data. Unfortunately it was not to be, yet again the route chosen was the one that leads to the No Entry sign. This app has nice looking maps plotted the correct route, warned about tolls so another one worth considering. The adverts are a bit annoying, if I purchase the app hopefully they will disappear. This is an interesting app for Android. It is a Dashcam with inbuilt SatNav and also has a virtual reality type display available of the route too. 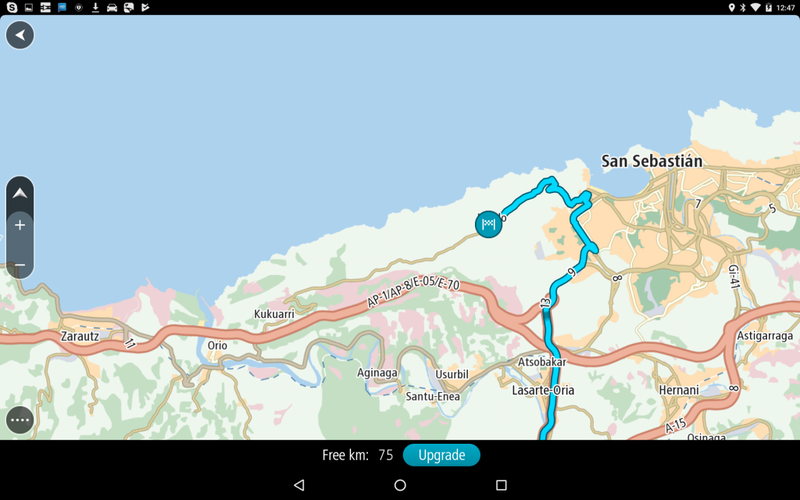 The sat nav part plots the route to the troublesome campsite near San Sebastian correctly BUT as can be seen from the screenshot below it displays the route as straight lines. 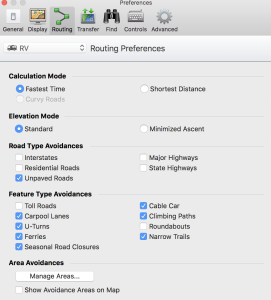 I need to test this whilst moving to see if the route is more defined when you actually drive down the road and that the route follows the twists and turns. Unfortunately due to the angle of the inbuilt bracket in Fiat Ducato based motorhomes the dashcam ends up looking at the top of the dashboard rather than out of the windscreen, with a different mount it may well be a winner. TomTom, OsmAnd, CoPilot and Navmii along with Google Maps so far seem to be the clear winners in my evaluation. Both of them are paid for applications and I am just using the free trials and so I will have to decide which to purchase. I need to test the iGo on the Parrot in my motorhome and will do that in the next few days and update this article.